My first experience with FRS was a few years ago after a hot, hot, hot run in Chicago. The race finished on the beach, there was no shade and we were spent. FRS was a vendor and their drinks were like a mirage – cold and surprisingly tasty. I think I had about 3 – one might have been used as an ice pack to just cool my face! About a month ago, FRS asked me to review a few of their products - Healthy Energy beverages, chews and powered drink mix. And, added bonus, giveaway their (??) on our blog. Since I’m training in Florida (hot, humid, hot) for the month and knowing how their drink saved me in Chicago, I said yes. FRS sent me 6 Healthy Energy Drinks. I used the drinks after workouts (hot, humid and sweaty runs) and in the afternoons as a pick-me-up. I brought the orange powder with me on a trip- I love easy access powders when I’m traveling that I can just drop into a water bottle, shake and drink. I made the mistake of drinking one of the drinks when it was only somewhat cold – big mistake! These drinks need to be ice cold (kinda like coconut water in my opinion). My stomach was upset after drinking it. When it’s cold, I loved it. FRS produces a full line of products, including ready-to-drink beverages, chews, powdered drink mix and concentrate. Their products deliver energy and immune system support. It’s made with vitamins, green tea extracts and the antioxidant Quercetin, which is found in the skins of blueberries, red apples and grapes. What’s cool about this product is that is was originally developed by a team of health scientists for chemotherapy patients. The main ingredient, Quercetin, has been demonstrated, in multiple clinical trials, to provide sustained energy, increased endurance, and immune system support. 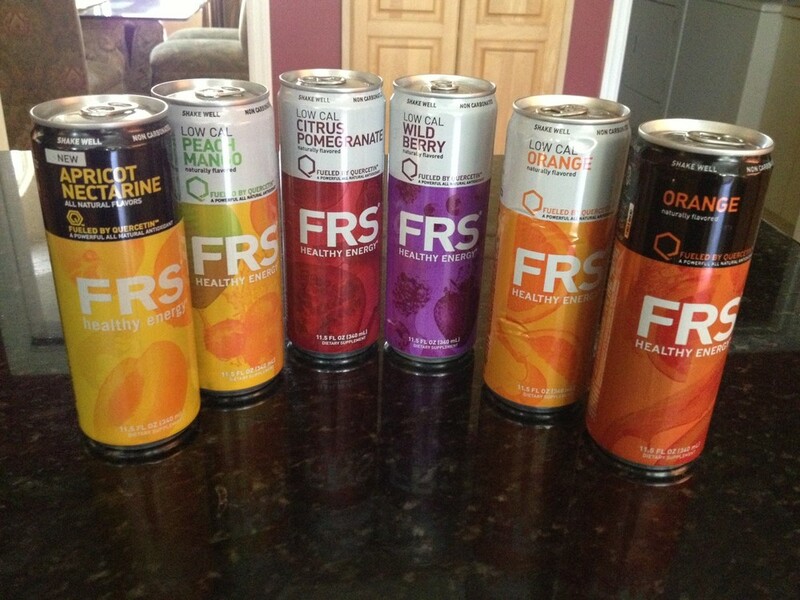 FRS products are available at GNC, Vitamin Shoppe, Whole Foods, Rite Aid, Walgreens, and FRS.com. -The ready-to-drink Healthy Energy drinks – great variety of flavors and little aftertaste. -Flavor variety – there’s a bunch of different flavors and I liked them all. -Easy access – shake, open and drink or pour! -Sustained energy – no crashing 20-60 minutes after drinking. -The orange powder – the aftertaste wasn’t my cup of tea. -The color -it’s neon yellow, which kinda freaks me out so I didn’t look at it! -The soft chews – Overall, the taste was okay – a little chalky for my liking though. I’m not a fan of a lot of chews or gels in general because my stomach doesn’t handle them very well. And, enter our giveaway for a FRS trial pack worth $30. Open to US residents only. To enter, visit http://frs.com, check out their products and leave a comment telling us which product you would like to try. We'll pick a winner on Friday, June 28 at 9am EST. Good luck!